Located just outside Rhodes Town, Ixia offers a wide range of accommodation. It also receives a constant summer breeze, which tempers the heat, and provides excellent conditions for windsurfing. The shingle beach follows the curve of the main road. Bathers should take care, as the waves can be a little rough. Most hotels have pools and deckchairs for visitors who prefer to avoid the sea. Rhodes Town's clubs and pubs are only a few minutes away by taxi. Visitors will find groceries and souvenirs in Ixia. Shoppers who travel the short distance to Rhodes' markets, or further to traditional villages will find a more authentic experience. Ixia has loads of bars, cafes and restaurants, with menus ranging from traditional Greek meals, to pizza or Chinese food. 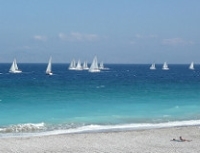 Rhodes Town and Faliraki have vibrant club scenes, and are close to Ixia. The hill of Filerimos is the most impressive archaeological site near Ixia, where visitors can explore the remains of the Temple of Zeus and Athena Poliada, Byzantine fortifications, a 14th-century church and several shrines. Ocean lovers will enjoy Ixia's adjacent beaches, which are attractive but not ideal for swimming. Against this, windsurfers and other watersports enthusiasts will welcome the conditions. Ixia is a very 'touristy' resort, dominated by foreign visitors and tailored to their needs. This has some advantages but certain people may feel that the area lacks authentic Greek spirit and has been over-commercialised.